The route that lies west of here, the Lolo Trail, was different from other east-west 19th century Americans trails. It did not witness a flood of cross-county migration. There were no covered wagons here. "... Stupendous Mountains principally covered with snow like that on which we stood; we are entirely serounded by thos mountains from which to one unacquainted with them it would have Seemed impossible ever to have escaped..."
were never able to penetrate the mountains to the west. U.S. Highway 12 roughly parallels the Lolo Trail, which is mostly above you, atop the ridges and saddles north or south of the highway. Erected by U.S. Forest Service. Location. 46° 45.415′ N, 114° 5.112′ W. Marker is in Lolo, Montana, in Missoula County. 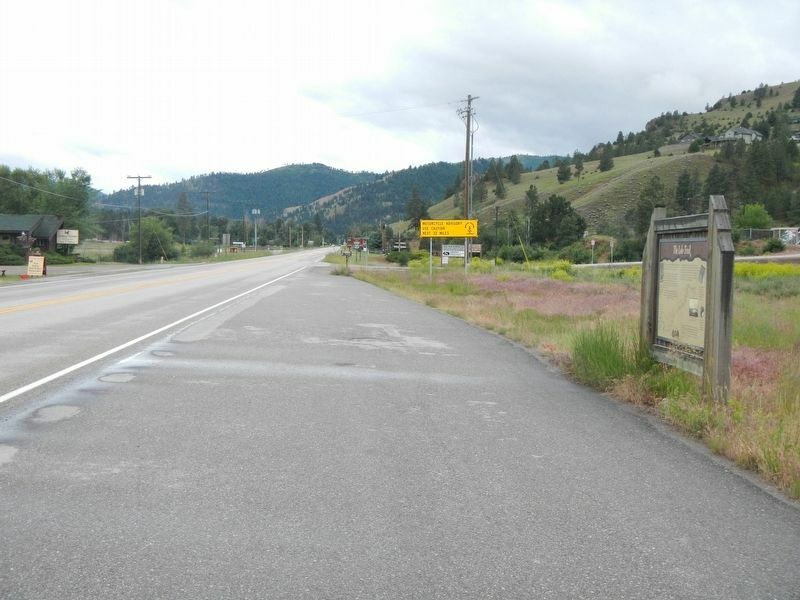 Marker is on Lolo Creek Road (Highway 12) near U.S. 93, on the right when traveling east. Touch for map. Marker is at or near this postal address: 6560 Lolo Creek Road, Lolo MT 59847, United States of America. Touch for directions. Other nearby markers. At least 8 other markers are within 5 miles of this marker, measured as the crow flies. Travellers Rest (approx. 0.3 miles away); A Crossroads of Culture (approx. 0.4 miles away); The Journey Home (approx. half a mile away); Uncovering the Expedition (approx. half a mile away); Following Formation (approx. half a mile away); Lewis and Clark in Salish Territory (approx. 1.1 miles away); Bitterroot Valley, Homeland of the Selíš (approx. 1.1 miles away); Lewis and Clark on Lolo Creek (approx. 4.2 miles away). Touch for a list and map of all markers in Lolo. More. 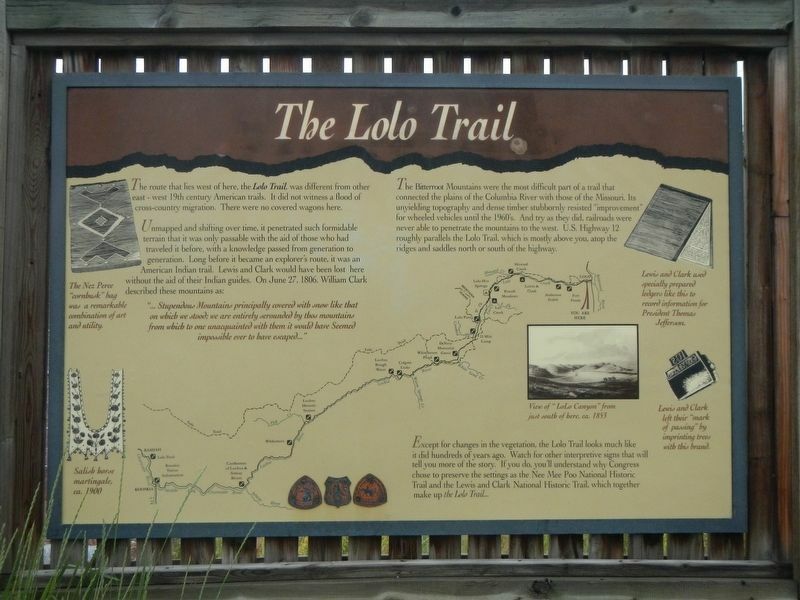 Search the internet for The Lolo Trail. Credits. This page was last revised on September 10, 2018. This page originally submitted on September 10, 2018, by Barry Swackhamer of San Jose, California. This page has been viewed 53 times since then and 8 times this year. Photos: 1, 2. submitted on September 10, 2018, by Barry Swackhamer of San Jose, California.